Unknown hominoid creatures have been reported numerous times throughout the South American jungles. Legends of the Didi, Vasitri, and the Mono Grande circulate in the region. One piece of evidence supporting the existence of a South American version of bigfoot is the famous photograph of de Loys Ape, photographed by a Swiss geologist, Dr. Francois de Loys sometime between 1917 and 1920. According to de Loys, he and his expedition were resting near the Tarra River on the border of Venezuela and Columbia. They were suddenly attacked by two 5-foot-tall ape-like creatures that waved branches menacingly and threw feces at the men. In defense, de Loys men fought back, shooting and killing the female. The wounded male escaped back into the jungle. 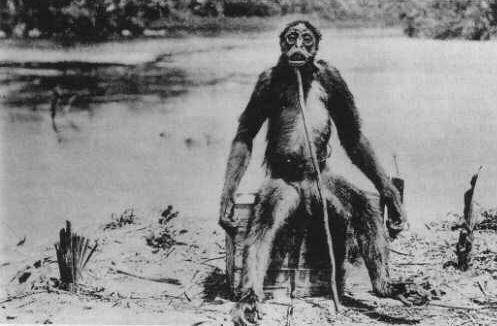 The ape had strange human-like characteristics, prompting de Loys to photograph the creature sitting on a crate, its dead body propped up with a stick. It is said that the creature was eaten by the starving men, thus destroying all evidence except the one controversial photograph. Nearly a decade passed before the image was made public. Fascinated by the photograph, a friend of de Loys, Dr. George Montandon published the image claiming it was a type of South American ape he dubbed "Ameranthropoides loysi". Scientists were quick to debunk Dr. Montandons claims. One such skeptic, Sir Arthur Keith, proclaimed that the photograph was a hoax picturing nothing more than a spider monkey with its tail hidden behind the crate upon which it sat. He also pointed out that the photograph had no indications of the creatures size. Many speculated that the crate was 20 inches tall, and based on that calculation, the ape would be nearly 5-feet-tall. However, the average height for a spider monkey is between 15 and 27 inches, its tail measuring 20-35 inches long. Ivan T. Sanderson, respected Fortean researcher and author of several books on the subject, also finds fault in Montandons claim. Sanderson writes in his book, Abominable Snowmen: Legend Come To Life, "...this picture produced by Dr. Francios de Loys is obviously that of a spider monkey...". After calculating the creatures actual size, he goes on to say, "Thus this animal, with its head poked up to an unnatural degree by a stick, measures about 27 inches. This is a fair-sized spider monkey but not even a large one. The original photograph is not just a case of mistaken identity; it is an outright hoax, and an obnoxious one at that, being a deliberate deception..."
Despite the skepticism surrounding this photograph, others maintain that the creature is not just a normal spider monkey. Anomalist Michael T. Shoemaker writes: "Examination of the photo reveals a strange, but logical, mixture of characteristics from different genera. The flat nose, with the nostrils widely separated and flared outwards, is characteristic of New World monkeys...Other characteristics that strongly suggest a spider-monkey are the round ridges surrounding the eye sockets, the long hair, and the extremely long fingers and toes. On the other hand, many of its characteristics contradict such an identification...Compared to other anthropoid apes, the creature's body is like a gibbon's, but its limbs and reduced thumbs are most like those of an orangutan...The most extraordinary characteristics lie in the shape of the head. Spider monkeys have a distinctly triangular face, with a pronounced prognathism. The creature's face is oval, with its lower half much heavier, and with more powerful jaws, than a spider monkey's. The creature also has little or no prognathism...Although many New World monkeys tend to have a more prominent forehead than do Old World monkeys, none has a forehead so highly developed as this creature's forehead." It is interesting to note that Dr. Montandon was a known racist and grossly anti-Semitic, and held a belief that different races evolved from different apes. In a letter to the Anomalist Magazine published in the Fall 1996 issue, cryptozoologist Loren Coleman writes that Dr. Montandon used the photograph to provide evidence for his racist hypothesis, suggesting that the Native Americans descended from the Ameranthropoides loysi. So it appears that one more cryptozoological enigma bites the dust. Although, as de Loys's photograph has been thoroughly debunked, it does not allow for the case of South American Apes to be officially closed. Numerous sightings of the Mono Grande (or "large monkey") have been reported throughout the jungles of South America. Natives speak of a 5-foot-tall, bipedal ape-like creature that is often said to be dangerous. Credible witnesses reported encounters with these creatures as well, the most recent report from Gary Samuels in 1987. As a mycologist working for the New York Botanical Garden, he was gathering specimines of fungi in Guyana. After hearing footsteps, Samuels looked up to see a 5-foot-tall, bipedal ape nearby.